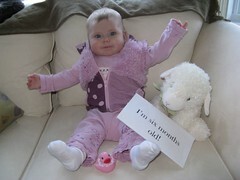 planetrumsey: Happy half birthday Avery! Avery is now a whole half a year old. If she keeps growing like she has been I swear she is going to be six feet tall by the time she reaches kindergarten. To celebrate her six month birthday Avery and Dad took advantage of the sunny weather and went for a long walk around the neighbourhood. On Sunday there are also plans to go for a walk in the woods to feed the birds. Posted by Anthony at 1/13/2008 12:53:00 p.m.